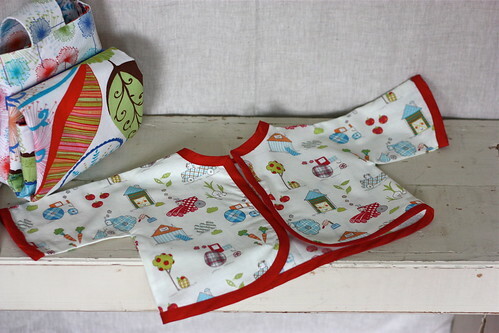 Welcome to Week 30 of the One Yard Wonders Sew Along! Melissa chose Alexander Henry Monkey’s Bizness Little Farm Natural. Melissa loved making this sweet little jacket. The pattern was clear and easy taking about 2 hours from start to finish. Melissa used quilting cotton in place of the suggested flannel. 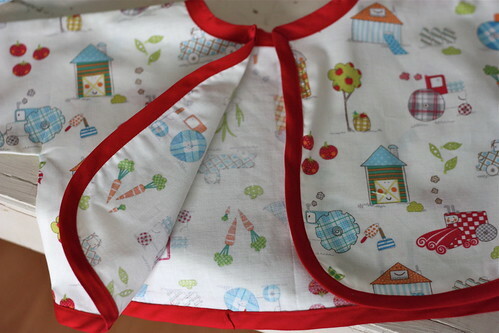 One addition she would make is to finish the two seams using a serger or zigzag stitch. Finished edges are nice for frequently washed baby clothes. Taking advice from the pattern she made the arms longer so an older baby could fit into the jacket. Lining the jacket and rolling up the sleeves would extend wear time as baby grows. Flannel lining would be warm and cozy. Melissa will make the Flyaway Jacket again. So cute and easy!!! Janis selected Valori Wells Wrenly Rosette Citrus. Decorative ribbon from the Ribbon Jar. Change to illustration. Please see PDF. The pattern is well written. Janis added rickrack in step 3, 1 inch from the edge, right after she sewed the bodice front to the bodice back at the shoulder seams. 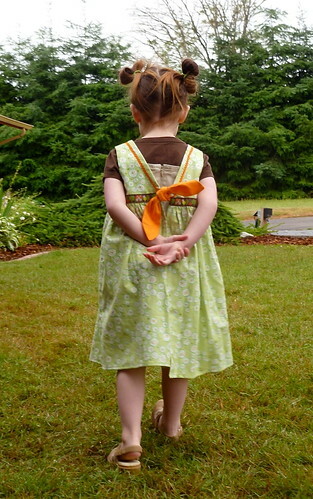 Instead of ribbon to tie the back, she made ties out of orange scraps about 3 inches wide by 6 inches long. 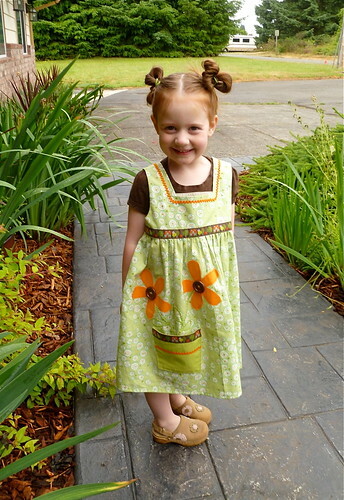 She tapered them to a point at the outer edge and made a pleat in the end that was sewn to the pinafore so that it was 1 1/2 inches wide instead of 3 inches wide. In step 4, Janis cut out two flowers and fused them to Pellon fusible webbing. 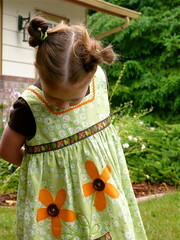 She added green rickrack to the center of the skirt to look like stems and leaves. Ironed the flowers to the top of the stems and zigzaged around the flowers about 1/4 inch in. 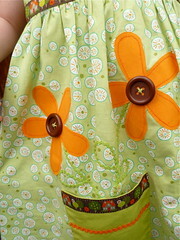 Buttons complete the center of the flowers. 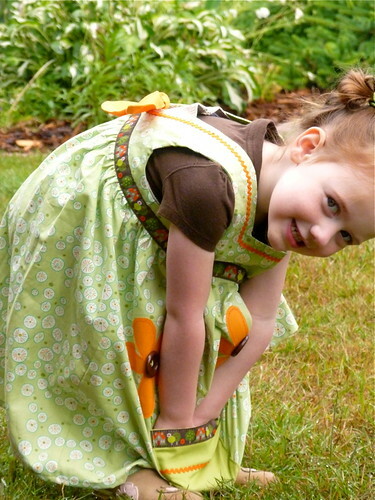 A pocket in the shape of a flower pot with a row of the ribbon and rickrack was sewed to the skirt at the base of the stems. Then she attached the skirt to the bodice as directed in step 5. After finishing step 5, Janis added ribbon around the base of the bodice. She tucked in the ribbon at each end where it met up with the orange tie, then sewed around the ribbon. For maximum length Janis turned the hem up 1/4 inch, ironed it and turned it up 1/4 inch again. Janis plans to sew the back closed leaving only enough open to take it on and off. Her niece wants to wear it without another outfit underneath.